ADAMA is a leading global manufacturer and distributor worldwide of crop-protection solutions. The company supplies efficient solutions to farmers across the full farming value-chain, including crop protection, novel agricultural technologies, and complementary non-crop businesses. As part of their communications mix, ADAMA Agricultural Solutions UK produces regular online clinics, presented by in-house experts, with the aim of educating farmers on a number of areas related to their business. Audere was recommended by one of ADAMA’s agencies, The Ad Plain, to improve the quality of the video output of the clinics and the overall viewing experience, hopefully driving more engagement. What does ADAMA UK think of Audere? Russell enhanced our online clinics by guiding us through every stage of the process, ensuring we had a professional, clean-cut video at the end of the very short deadline date. His knowledge and experience in this area really steered us in the right direction. What has Audere achieved for ADAMA UK? 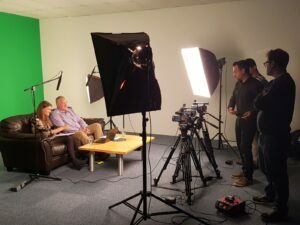 ADAMA UK had been successfully delivering their online clinics using in-house resources, filmed in their offices and streamed live via the Zoom platform. Before we were involved, the clinics consisted of a mix of slides and a video feed in the corner of the screen – feedback from viewers had included wanting to see the presenters on screen. These were then made available to view on-demand on the company’s YouTube channel – example below. ADAMA UK streamed the clinics in a live environment, early in the mornings, to try and catch as many of their target audience with the aim of driving engagement through polled questions. However, due to the limited numbers of viewers actually watching live, we felt they would be better investing in improving on the quality of the video output and simply providing the content in an on-demand format. 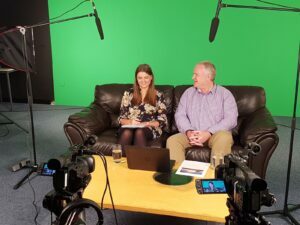 We therefore recommended moving the production to a professional studio and worked with MWS Media, a video production team based locally to ADAMA UK’s offices in Thatcham, where we filmed the clinic in-front of a green screen (below), using a three camera set up. The resulting video improved the viewing experience immensely by using full screen video and switching the output to a mix of close-up shots and wide camera angles to full slides, as well as using on screen lower thirds to display viewers’ questions that had been sent in advance of the show. You can see for yourself the improvement in the resulting video below. If you would like Audere to help produce your live or on demand webinars/clinics, please get in touch using the Contact Form.